PRICE TEN CENTS . . ONLY ONE MEASLY THIN DIME "IN ANY STATE IN THE UNION — BUT MONTANA"
Not a one of these names or places is COINCIDENTAL. T H I S I S I T ! Most of this material, pictures and writing is copyrighted — and branded. 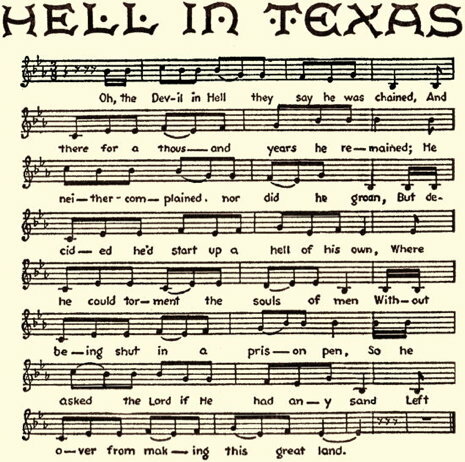 You are certainly welcome to reprint "Hell in Texas." If you want to extract any anecdotes or the like at any time for which I am responsible, feel free to do so. 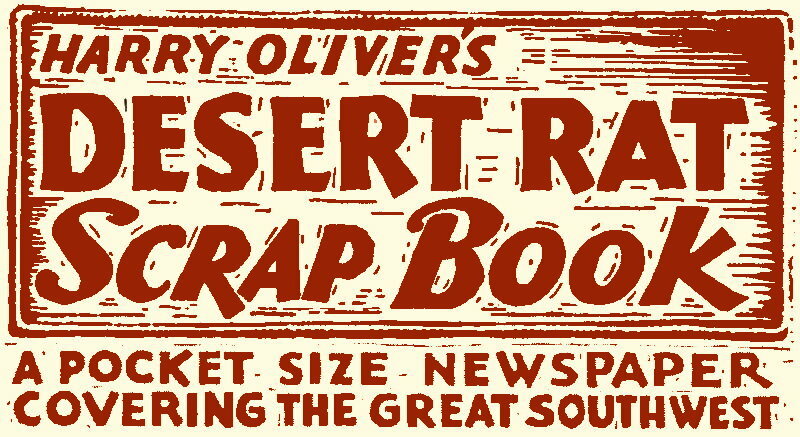 I am glad to meet your Desert Rat Scrap Book and send you a dollar for a two year's subscription. 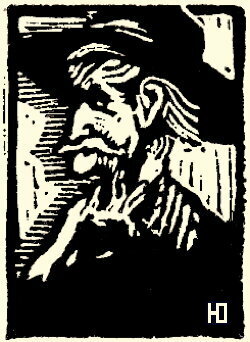 J. Frank Dobie of Texas, whose name shows up in two other places in the packet, is the author of some fine books on the southwest. "Coronado's Children" is loaded with tales of Lost Mines and Buried Treasures. It is my number one choice of the ten best books on the southwest; number two would be "The Journey of the Flame" by Fierro Blanco, (about little known Baja California). Then back to Dobie for number three, "Apache Gold and Yaqui Silver." These three books are chuck full of legends, traditions, tall tales, and the lore of our southwest. (Your library should have them). And all desert rats should read them. And this answers some of your letters as to what to read. Your Editor is not saying what the next packet is to be. 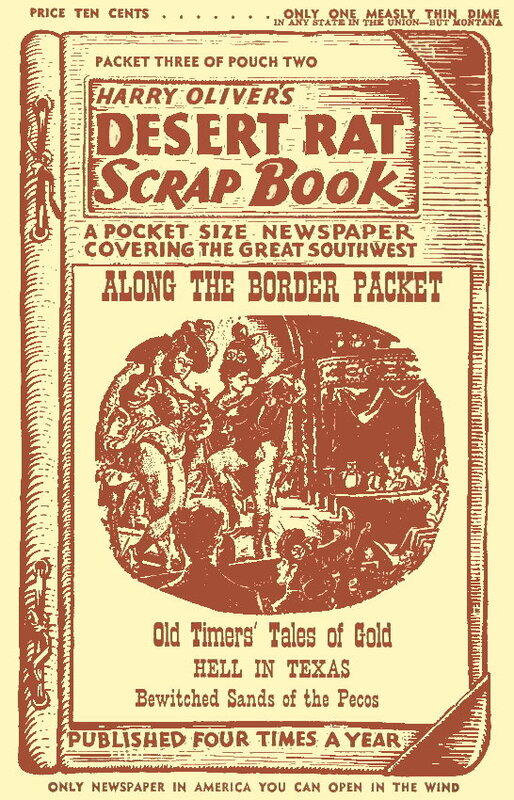 We had a Wind packet, Burro packet, the Mojave packet, and the Along the Border packet. 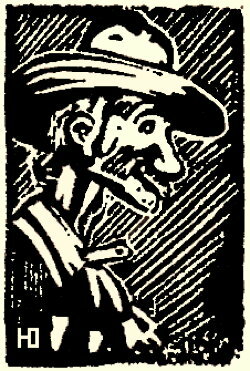 —The wind packet had the best burro stuff, the Mojave packet a lot of Death Valley; this Along the Border packet has —?— from now on I am just going to grab the best stuff I can, and give the packet a number. Nevada, Arizona, New Mexico, Texas, Mexico, and the Californias, all mixed. On the cover you will see that this paper sells for 10¢ in every state but Montana; I am mad at Montana. 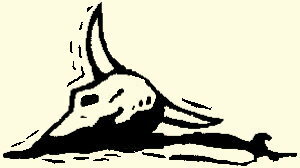 I lived in Montana in 1909, crossed from Missoula to Kalispell by 4 horse stage, when they were selling all our buffalo to Canada. I reprinted for them (in packet No. 3) the greatest dog story ever; it was Charles M. Russell's "Dog Eater." 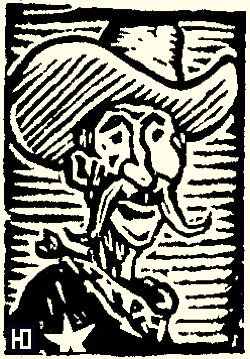 That great western artist from Montana was also tops as a humorist. I am mad and I have a map of the U.S. in front of me, and to find a state that I have fewer subscribers in I have to go east as far as New Jersey. So if you live in Montana, send 15¢ for your trial copy. By the time this packet hits the water holes they will have machines to do a better and faster job of everything that people have to do in this world, except think and get the best part of a woman in an argument. Your Editor finds that now days to be successful the world expects you to make money too. Anyway, Truman learnt me something. When I got my quarterly dun from the income tax office, I just vetoed it and sent it back. The cover. 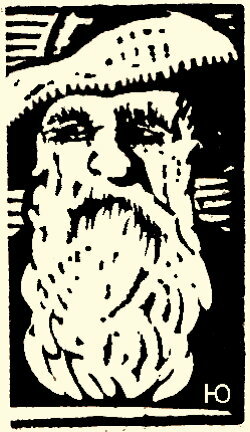 It's from the Gold Gulch Gazette, a little paper I printed at the San Diego Fair in 1935 . . . it too was a part of my 21-acre "Rip Roarin'st Mining Camp since '49." Remember? Truth is such a precious article, let us all economize in its use. Your old editor sits at a desk, a grand old desk that you wouldn't expect to find in this old adobe fort. — When Lucille Montgomery of Mecca loaned it to me she told me there was an old superstition that if one works at the desk they are sure to become wealthy. Just one of those pleasant little bits of talk I remembered because I liked it — About three months ago strange things began to happen. I would put something away in one of the two long rows of pigeon holes and find it in a drawer two days later. Then one day I looked in a pigeon hole for my unpaid bills and darned if I didn't find them in with the paid bills. If I could only teach that PACK RAT to stamp them paid I, too, might become wealthy. 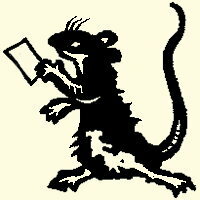 Say you that's reading this, I bet we can blame that Pack Rat for misplacing your letter. I meant to answer it. —Ed. You Texas folks are not going to like this. The largest County in the U.S. is San Bernadino, California, with 20,131 square miles, two and aone half times the size of the State of Massachusetts. Next, Coconino County, Arizona, with 18,753 square miles — Nye, Nevada, 19,064 — Elko, Nevada, 17,181 — Mohave, Arizona, 13, 403. TOMBSTONE—While riding range west of here Mike Bakarich surprised two pronghorn deer. 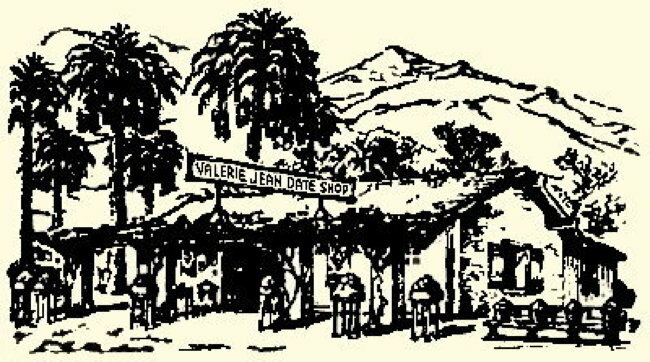 When Ed Schieffelin made his silver strike last century the entire San Pedro valley was well populated with antelope which furnished the main fare for Apaches. The last herd seen in theis vicinity, it is said, was in the fall of 1903 and the pronghorns have been considered extinct in this area for many years. 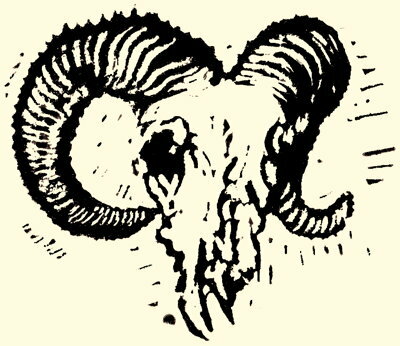 Mike thinks pronghorns are like Tombstone — "Too tough to die." a Desert Rat, "How far would you say it was to Quartzite?" 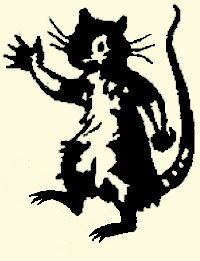 "Wal," calculated the Desert Rat, "It's 24,992 miles the direction you're going; 'bout 27 if you turn 'round." 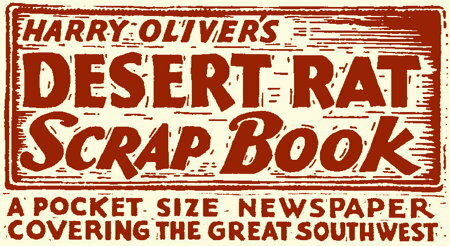 This packet of the Desert Rat Scrap Book comes from the new presses of the Desert Magazine at Palm Desert, just over on the other side of the dunes from Fort Oliver. Randall Henderson, editor of Desert, and veteran newspaper publisher, says this is the first time in 35 years of publishing experience he ever turned out a 5-page newspaper. From J. Frank Dobie's CORONADO'S CHILDREN, by permission. "Then the Indian take him and a burro to where was some sand in the creek. They put some sand in sacks and bring it on the burro, and they get twenty-five dollars worth of gold out of that one load of sand. 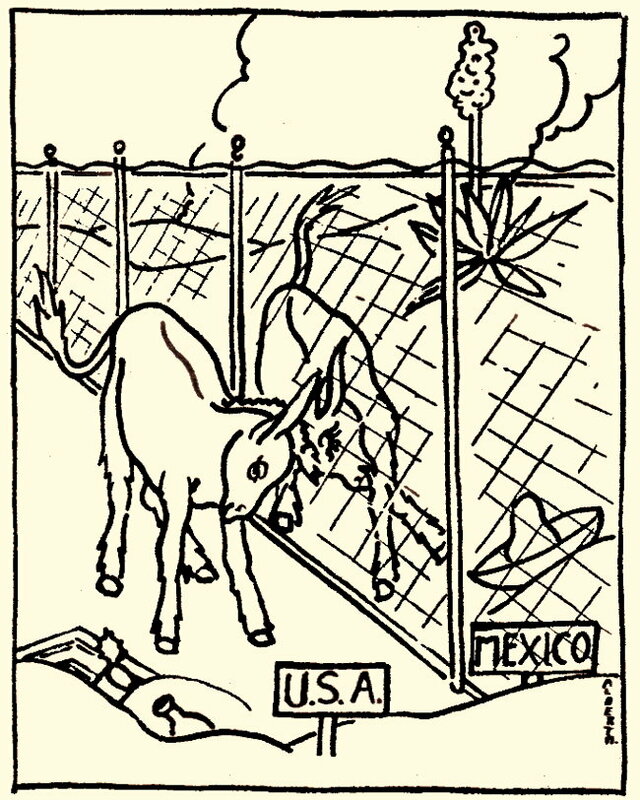 "That night the Indian disappear, and the next day my grandfather he go with two burros and load both with the sand. He bring it up, and from it he do not get one thing. Nothing, I tell you. That old Indian is gone, but he has his eyes on the sand. Maybe he was a brujo (a wizard). Maybe the sand was embrujada (bewitched). I do not know. I know when the Indian is gone the gold is all gone too." I say the tale as 'twas told to me. An onion is a food that builds you up physically and drags you down socially. "Lew Lewis of Indian Wells says a fellow gets tireder working two hours at something he doesn't like than he does working fourteen at something he does like. Lily de la Cerda of Guatamala while here at Fort Oliver told a story about her sister, Graciela, who had a baby tortoise which she kept for a pet. One day it died. Graciela placed the dead tortoise in a little box and buried it. A few days later while lamenting the loss of her little pet, she met it coming up the pathway to her home. 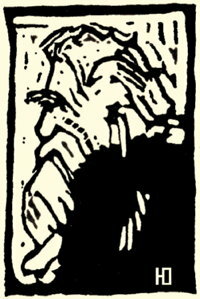 Writing of the old stage drivers in his "As I Remember Them," C.C. 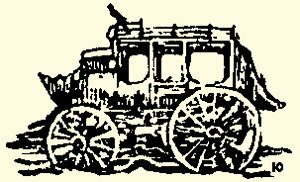 Goodwin, the kindly Nevada newspaperman, said: "As it is, the old race have all passed away, as did that driver in Sacramento who, when dying, whispered: "It's a down grade and I can't reach the brake." So I am reprinting this yarn from Packet one pouch one. —Ed. Nogales, Ariz— A few months ago old man West died here at Nogales. His two sons, Ted West, a newspaperman, and Bill West, a paper-hanger, received $250 from the small estate. Bill, the paper-hanger, deposited his in the savings bank, where it still remains. Ted, the newspaperman, had always had a great yen for tequila in fancy bottles, and expended his heritage in the purchase of a grand array of the fanciest he could find. He had just finished drinking these, and has sold the strange, fantastic, empty bottles to a tourist for $360. "A FORD WILL LIVE three years here in the desert — a dog three times the years of a Ford — a horse three times the age of the dog — a man three times the age of the horse — and a burro lives three times the age of the man." "You never see'd a dead burro none o'you, ain't any of you going to live long enough to know how long they live either?" "An' you what's prospectin' with Fords is outa' luck, you won't find fold. Why they cut roads an' railroads into mountains an' thru deserts an' across all kinds o'land for years an' never hit gold on roads, you gotta get out with burros an' find it." "I been out here in the desert twenty-six years, six years huntin' gold an' twenty years huntin' for my burros. I didn't find my mine while I was huntin' gold either, I found it while I was a'huntin' them dad-burned run-a-ways." 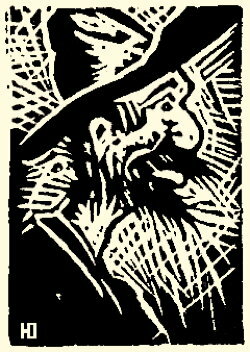 "Them Ford ridin' prospectors wasn't sayin' nothin' jest a'lookin' at each other like sheep. Did yo uever [sic] think what us desert rats owes to burros?" he asks. "What about those water holes? Every last one of 'em coverin' fifteen hundred miles from here clear up to the Snake River is known to us because a burro found it." "Suppose that's mighty consolin'," snorts Sandy as he steps outside, then all of a sudden the air gets blue. It's Sandy lettin' out the longest, finest string of cuss words we've heard in these parts. I come a'runnin' to see what was wrong. It was a'plenty. His burros got loose an' was hittin' off for the horizon as tight as they could go. As we chugged along on three cylinders the old flivver hotter'n a cowboy's pistol on Fourth of July, homeward bound after hours of high class cussin' an' wranglin, I was admittin' to Sandy that burros rate prize number one for enlargin' desert cuss word vocabularies. "Stop," yells Sandy lookin' across the wash we're ridin' down. "That's likely lookin' rock yonder," and that DEAR POSTERITY is when we staked out our claims on the now famous Burroford Mine. "From My Book Desert Rough Cuts"
"A driver on a Mexican stage was asked about the people who live in the villages on the mountainside. He said: "There is a narrow road up the mountain. Some of those people live and die without ever seeing a city. Many of them never read a newspaper.' And then after a thoughtful pause he sighed and concluded: 'They are very happy.'" I asked Dry Camp Blackie if he was a Folk Lorist, and he said — Nope, I'm a Poor Folkest. If you don't know what a screwbean is, you won't see as how I've named Benny right. A screwbean is the bean of the desert mesquite an' its shaped like a corkscrew so's it can twist itself into the sand an' get to grow. Benny is already growed an' lives down in the windiest part of the narrows. He lost sixteen hats the first year he was there. Then he finds he can screw them hats on, usin' the wrinkles in his forehead to hold'em an' take'em off with a big pipe wrench stickin' out of his 'dobe wall. It's so damned windy at Benny's place he's had a pack of trouble. 'Course you can have trouble without wind, like I had once when I put up two windmills which was one too many for the amount of wind we had over in my corner. Benny's trouble was contrary-wise to mine. He had to anchor his windmill against the long barn to keep it from blowin' away. He's awful near-sighted, Benny is. I think it come from lookin' so much at things close around him, checkin' up all the time to make sure the wind ain't took them. Just after that ornery blow-storm last Friday night Slim Law comes back from with the news that he's out to make an arrest. Benny comes along soom after and doesn't notice how Slim's polished up hs deputy sheriff's badge. Ever since the big storm Benny's been feeling too low to notice much of anythin, 'cause the wind finally took his windmill — barn an' all. Meetin' Slim Law cheered him up a bit an' he got confidential and told how it happened. Accordin' to his story, when she started to blow he was takin' a siesta in his 'dobe house an' he wakes up dreamin' he's been yanked out of bed by a howlin' coyote an' finds himself blowed onto the floor and the wind a'hollerin' like it's crazy and a'cuttin' a ninety-mile gale through the window. He goes out to see what's doin' an' the wind helps him along so fast he has to hang onto a rock. He can't go back an he daren't go ahead, so he just hangs onto that rock while the wind proceeds to unscrew his hat and thin out his whiskers. Benny's windmill got twirlin' so fast it was a'shriekin' like a factory whistle, an' the first thing Benny knows, up she goes, barn an' all, like she was a big paper kite. There was no arugin' [sic] with that wind, but Benny gave it a lot of cussin'. It took the windmill clean out of sight an' kept Benny wrapped onto the rock so's he couldn't move if he wanted to. Benny hangs on about an hour. Then the wind whips around sudden an' changes to the east and he's blowed clean back to the house again. Then he hears a familiar whir an' darned if he don't see that windmill an' the barn, passin' over the house headed west. Benny's mad. He grabs his gun an' shoots four rounds of buckshot out the west window, tryin' to cripple the windmill, but he couldn't stop the darn thing. Durin' all of this story Slim's been look' glummer an' glummer at Benny, an' now the whole thing don't seem to set right with him. "Benny," Slim says, severe, an' stoppin' the polishin' of his badge kinda regretful-like. "I'm afraid youre [sic] the man I'm lookin' for." "Your barn an' windmill's all cracked up east of here. It never got blowed back. It might interest you to know that I'm lookin' for an hombre that shot at the airmail Friday. That shooting' was done at the narrows an' the plane was headed west." "That you're the hombre," finishes Slim. "Wal, 'spose I did shoot at the plane," snaps Benny. "The durn thing has no right asoundin' like my windmill. I'll take it up with the government. It warn't no fault of mine." "You better lay low," says Slim, "and put in a mail-order for eyeglasses, 'cause the next time you take to shootin' at a plane, I'll have to take you to the hoosegow." "What was the idea of shootin', anyway?" says I, as soon as Slim Law clears out. "To bring down that jug of hard stuff tied under the rafters of the barn," says Benny. "Oh," says I, seein' daylight. "That's different." Somehow, right then, I had a nice warm feelin' for Benny. I guess I was just sorry for him. 'For I knew it, I heard myself sayin', "Things is allus slack on Monday. 'Spose I lockup up the store an' you an' me investigate east of here. Be a shame to waste a perfectly good windmill . 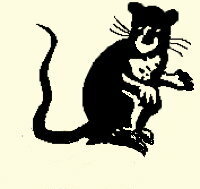 . ."
Dry Camp Blackie says, desert animals are undependable in hot weather — complained today that the pack rat he had taught to bring him kindling every morning, brings twice as much in hot weather as in the cold weather months and wants many more crackers in payment. He is worried about his ant proof bread box. Says the horned toad he has on watch under the bread box complains that it doesn't get enough ants to eat. Blackie says the two badgers he has trained for prospecting are over-doing it and have dug up his garden three times just keeping in practice. Says his burros alarm clock attachment is two hours ahead of daylight savings time. So his troublesome days start early. More than 200 per cent of the doctors endorse this newspaper — NO CIGARETTE CAN TOP THAT. Blackie (galluped) to the doctor. His signed statement was, "I read it, cut it in two, sent it to two other M.D. 's, and they both O.K. 'd the half they first had, swapped halves and O.K. 'ed it again, then sent it back to me. After 27 catgut stitches it folds O.K. and I am sure will be O.K. and should live to a ripe old age. Fort Oliver has one bedroom with path. One burro, the ugliest little desert canary they could lasso, is heading for the New York orphanage via TWA air express this week, compliments of Constable John "Red Ryder" Joslin of Red Mountain and Jess Kell. The project started when Joslin met a group of youngsters from the orphanage at a party given by western screen star Monte Montana and other celebrities. Red met the boys and before he had finished talking with them, they had secured his promise to ship a real live burro back to the home. At a desert crossroad at Patagonia, Arizona, there is a road sign which reads, "Take care which rut you use. You'll be in it for the next twenty miles." Along the western deserty coast of Baja California is a place where cactus collectors take off their shoes to hunt for cactus. A small type looks just like the pebbles that cover the ground but sure don't feel like them to tender feet. Ted Hutchison, Desert Plant Wizard of Rancho Mirage says, "You can find about three of rour of them to the square foot." Editor's Note — I knew Ted was a square sort of fellow, but I did not know he had square feet. 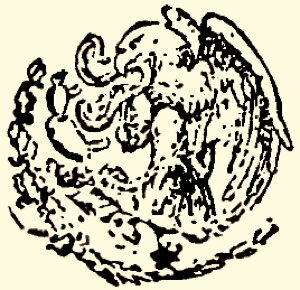 The department of education in Mexico wants the children in that country to look to the old Aztec god, Quelzacoati, for their presents each Christmas, rather than Santa Claus. Americans no longer are "Gringos" in Mexico, not even to the Indians, Octavio Spindola, Mexican Ambassador to Chile, said. 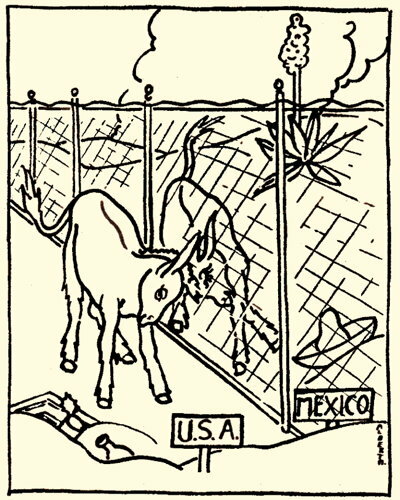 The word "Gringo" never was specifically applied to Amereicans, but was a term for any foreigner. 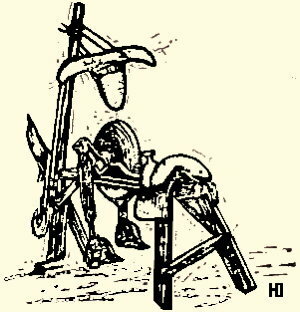 Back in the early California Rancho days when the squeak of the Careta (Mexican two-wheel cart) got too loud, a man on foot would dash up and pour tallow on the wooden axle. This was how the gringos came to call the Mexicans "Greasers." I got this from a book just off the press. New York Current Books Inc.
Miguel was a grizzled old fellow of sixtyfive. He was charged with drunkenness. When he pleaded guilty, the jusge asked: "Have you ever been in here before?" "Si, Senor," said Miguel. "Don't you remember, it was two years ago? You asked me in what year Columbus deiscovered America." "I remember," said the judge. "You were boracho then too, weren't you? You couldn't answer the question." "No, I could not answer then, but—" with the pride that knowledge brings— "today I know 1492!" The sobriety test was good enough for the judge, who recommended leniency. His desert sketch book is temporarily on the shelf because he was seduced by a blond widow who died over 150 years ago. Feliciana Arballa went on the Anza Expedition riding horseback from Central Sinaloa to San Francisco. Hilton's new beek "Feliciana" is the account of Anza's Expedition through her eyes. A 'dobe house is fireproof, if built right, and one story high; earthquake proof, dust proof, sound proof, heat and cold proof, rat and termit proof, oh, and yes, bullet proof and almost proof against bad design, due to the thickness of its walls and damned if they don't take on more character with age. No matter what the geologists says, gold is where you find it. The trouble with this country is that the Indian didn't have strict enough immigration laws. The Fort Commander has made arrangements for the desert season to exhibit the collection of Vernon Peck (well known collector of music boxes of the Gay 90's firearms from the Civil War period and miscellaneous western relics) combined with Oliver's desert collection the public should enjoy this Desert Rat Museum and Circus and anything can happen. 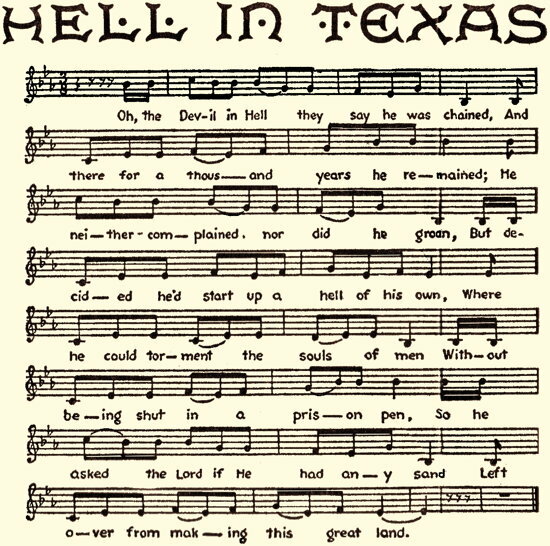 From "Hell in Texas," by George E. Hastings, Southwestern Lore, Publications of the Texas Folk-Lore Society, edited by J.Frank Dobie. 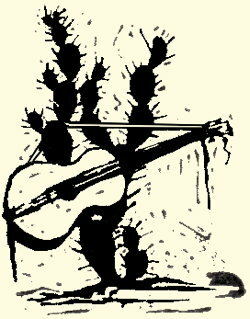 This song is attributed to John R. Steele of the United States Signal Corps, "stationed at Brownsville in early frontier days." 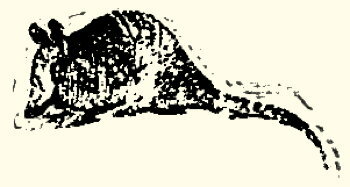 (1) The word that went here was a corrupt form of ajalote — Texax-Mexican [sic] for that wondrous and hideous form of aquatic salamander, so common in the tanks and troughs of West Texas, known as water-dog or water-puppy. —G.H. "I've hell on the inside as well as the out! Back in 1788 as the story goes, soon after the Paula [sic] Branch Mission was completed, some sturdy Franciscan fathers arrived at Mil Palmeas and started a small branch mission. According to the old story the 13 arches that had been built crumbled from earthquake shock and discouraged the builders who left in a severe sandstorm to return to mission San Luis El Rey. As near as historians can determine, it was in 1858, the heighth [sic] of Butterfield stage days, that Enrico Oliveras with the help of his two brothers built the Wells Fargo stage station in between the ruined arches. A year later the stage road was changed and Enrico, discouraged, went back to Mexico. In 1874, when the railroad came to Mil Palmeas, the old ruins were again roofed and an addition added, and was used by Frederick William Oliver, a railroad surveyor, as his headquarters, and received its name, Fort Oliver. Fort Oliver, as it is called today, is said by some old timers to have been build years ago by a showman, Harry Oliver, also known in Mexico as Enrico Oliveras. An expert and an authority on early Californian architecture who has collected and surrounded the old Fort with true western relics. 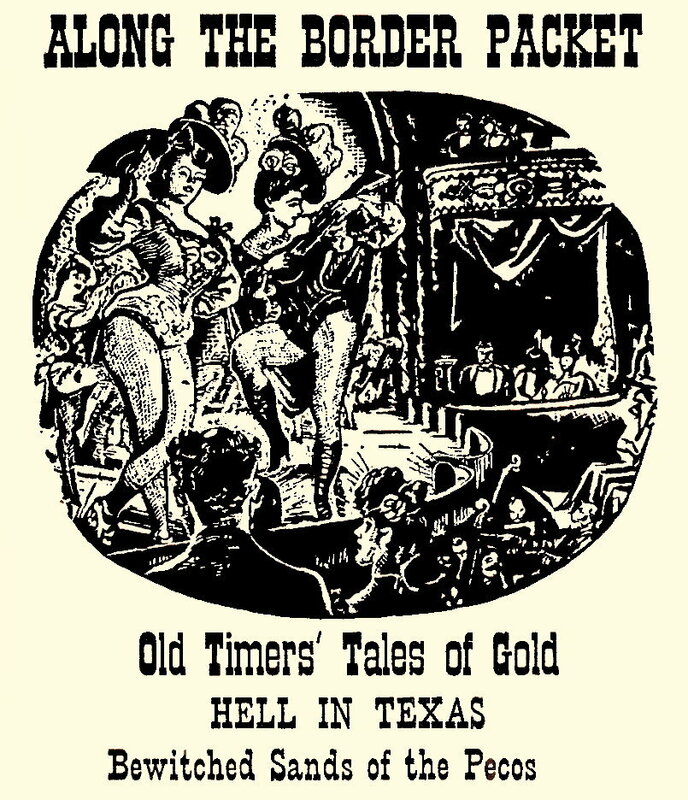 He is the same Harry Oliver who spent years as an expert on Western Art and research for the motion pictures of Hollywood, having been the Art Director on the pictures, "Viva Villa," "Will Rogers Pictures" also designer of western exposition shows at Fort Worth, Dallas and San Diego, author of 50 desert stories. 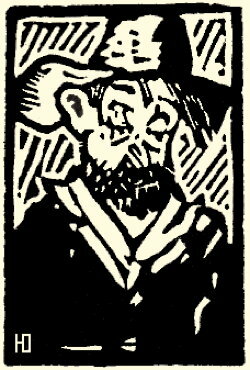 He is a leader in treks in search of lost mines and buried treasures such as the Peg Leg, Lost Gun Sight, and Lost Dutchman mines. You may have seen him at Rodeo and Western shows in his old rickety 1928 Ford Station Wagon. Whiskers, his famous dog, and he will be selling his well known publication, "The Desert Rat Scrap Book." Editor's Note — Ben Bean has made one slight overstatement in his two stories of the old Fort — it's about the dog. I don't always have "Whiskers," my dog, with me. The "Screaming Sands" of "Smuggler's Charybdis"
The Algodones, fascinating sand dunes 20 miles west of Yuma, Arizona, lie one half in the United States and one half in Mexico, 75 miles long and from 18 to 24 miles wide. This sea of sand dunes (some two hundred feet high) is free of as much as a blade of grass but for one oval-shaped island one half mlong [sic] straddling the border. This is— "Smuggler's Charbydis." A flowing spring, its water quickly blotted up by the sand dunes; desert growth as one would find 20 miles east or west; the free whie sand sloping to the gorund on all sides — no explanation of this permanent wind eddy (it is an outward — instead of an inward eddy) that screams the screams of a woman in a whirlpool has come to the Editor these many years. — The smugglers camp here miles away from road or trail, watering their burros — knowing the screaming of the ravishing woman means their fresh tracks are erased from the desert sands. From the unpublished book by the Editor, THE LEGENDS OF MOTHER DESERT, with 100 paintings in color by the great Desert Painters of today. Look nice in Arizona Highways wouldn't they? Pack Rats, Desert Tortoises, Horned Toads and Chuckawallas have a time taking care of a baby chick away out on the desert in this kid's book — a well told story with many fine pictures. $2.00 at you bookseller or Reynal & Hitchcock, Inc., 8 West 40th St., New York, N.Y.
Packets 3, 4, 5, 6, and 7 can be had by anyone at 10¢. Everyone is Southern California knows of or has been to Knotts Ghost Town. It's for you folks way off in the other corners of our country that I describe it. — It's a composite of Old West Ghost Towns; unlike a museum, it works. You get right in to it; relics, yes, but no hands off signs. Camera clubs, student artists and writers find the old West all around them. It's a school to them that's lots of fun. Old timers relive their pioneer days here in the sun while swapping lies. Paul Bunyan's face would surely be red were he to visit Mrs. Knott's kitchen and know that sixteen thousand biscuits had been baked there many a day in four hours. 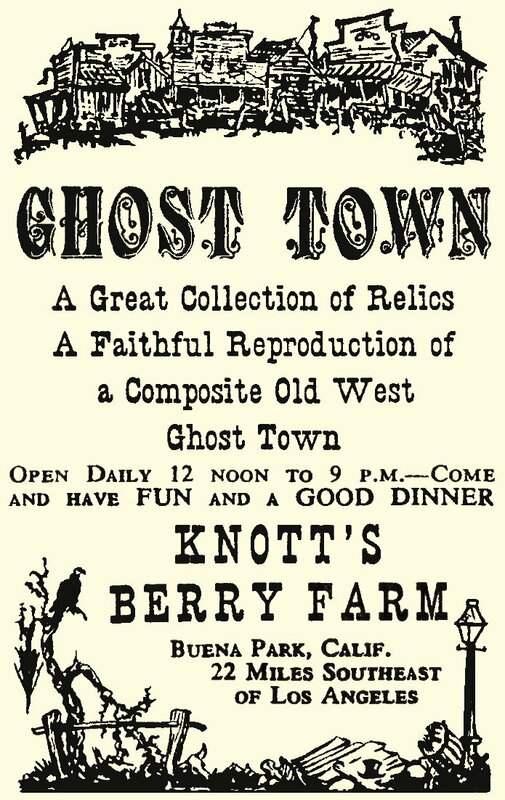 These facts are known to many but I am about to tell some facts about this Ghost Town that not even the Knotts know. I had worked putting this paper to bed all the night before and was on my way back to the desert after sleeping the day through. There was a light fog — my old station wagon creaked with the weight of the 15,000 copies I was taking to the desert to mail to you readers. — it was about 2 A.M. — I wished I had not talked so long to "I.W. Harper" — I said to myself, (one gets to talking to one's self when you mix your nights and days all up like I had) "if I pull in to Knotts place maybe I can sell about 1,000 or maybe 1,500 copies to Ray Hetherington's book shop, taking some weight off those weak old springs." The half-moon was coming up through the light fog as I pulled in to the empty parking place. The old Ghost Town looked spooky, I thought. As I stopped my car a cordial voice said, "Hello, Mr. Oliver." I had not seen him as I turned in, but he stood not over three feet from my car, his white whiskers not quite as white as his smiling white teeth — I had never seen him before but I liked something about him, his smile — Stepping out of the station wagon, I asked him jokingly, "How are all the Ghosts tonight?" "Most of them are pretty happy," he answered. "In fact they're having a great time over in the Music Hall, but we will go meet them after a while." Then he went on to say, "You know, Mr. Oliver, I read your Desert Rat Scrap Book, and I kind'a knew you would like the folks that run this place after midnight. They're nice people and they like Mr. Knott and are so happy he keeps bringin' in the old stuff they knew so well when they were on the day shift. We all help him find it." "Come," he said, "I'll help you meet the folks; I'm going to call you Harry Oliver like we are talking to them. It's better publicity for you; you see these Ghosts, as you call them, can sell a lot of your papers by suggestion." "How," I asked. "Well, I could wait and let you hear them at the dawn meeting, but I tell you they sure work together, they want this town to be just like towns were back in their day shift days, so each night they dedided what to tell Mr. Knott to think of next. After the vote they go one by one to Mr. Knott's house and each whisper in his ear as he sleeps, just how and what they want. Mr. Knott doesn't know where the ideas come from, but this town grows just as the finest group of Frontier Ghosts ever to come together have planned it." "You see we have two kinds of Ghosts here. To be a real upper-class, top-flight Ghost, you must have parts of your day shift belongings on display in this museum of memories. As an example, you will see Lola Montez dancing with Wild Bill Hickock. Lola is a real ghost. The fourth music box as you come in to the Music Room on the left was hers. She found her bustle in the Old Store and the Book Storee has three books that were hers. "To Wild Bill Hitchcock, we voted a pass, because he is such a fine fellow. 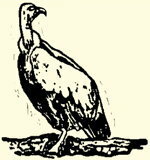 He was introduced after Paul von Klieben painted his picture for Mr. Knott. Three times we have whispered in Mr. Knott's ear where to get Wild Bill's guns, but I guess they cost too much. I used to be Chief of that fire-fighting apparatus." He pointed into the old Fire Barn we were passing. "One reason I know you so well, Harry, is that we have some of your belongings here, the Indian stone and Olla you sold Mr. Knott and that big gold nuggett. If you were to have a fatal accident on your way home, we would send you a rider with two flying horses and an invitation to come here and stay." "Harry, you are in for it, here comes Kate. She is the only one here that doesn't like Mr. Knott. Maybe you can help her." My bearded friend tipped his hat to a tall redheaded lady in green. 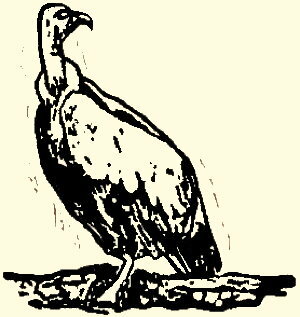 "Kate, this is Harry Oliver, who is very friendly with desert buzzards and is not afraid of sidewinders. He may be with us soon. Tell him your story; maybe he can help you." "I know you, Harry," she said, "you play with Ghosts. You planted all those peg-legs in the desert to give the rock hounds some hope of finding old Smith's lost mine. Some of the day shift people did not like it, but I can't see why. The fish and game commission plant fish for the fishermen. 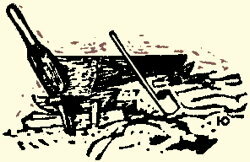 Why shouldn't you help the Sunday prospectors?" "I want to tell you my story, Harry. Fifty years ago I lived in Pasadena. 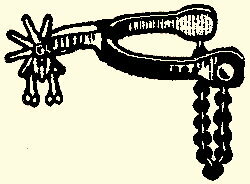 I loved horses, and as a wedding gift my husband made me a present of the first rubber-tired buggy that ever rolled up Colorado Boulevard. I loved that red wheeled buggy. I think if you would tell Mr. Knott that of all the Ghosts here I am the only one he has hurt, he might change and help me. Nine years ago he and four men picked up my buggy and set it over a yourn eucalyptus tree. Year after year the tree has grown. It will break my lovely red-wheeled buggy into a thousand pieces, like the wonderful one horse shay, on Friday the 13th of May 1949. Tell him, Harry, ask him to please save it." As I was promising her I would try, and she was explaining to me that Mr. Knott knew I was kind'a in touch with the little man who pulled the ice box light, and he would understand that it would be possible for me to talk to Ghosts and know about her and her treasured red-wheeled buggy, my white-bearded friend returned. "Harry," he said, "an old printer that owned the old time Washington Press over in the Western Book Store wants to tell you where some fine old type is buried. He says it has some odd old type faces that you haven't got and it's just what you want for your paper." I looked at him in his 49er shirt. 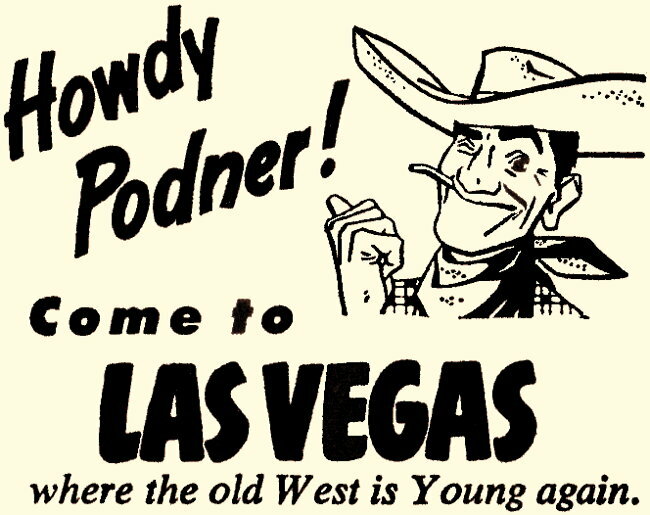 "Gosh," I said, "I bet someone here knows the desert and could tell me where the Lost Peg Leg Mine is." He shook his head saying, "It's not for you to find; you are not to get rich, Harry." "Come, we'll find out about that old type." As we walked toward the book shop, Kate said to me, "Dawn is coming and we must go soon, but I will be listening when you ask Mr. Knott to save my buggy." The old printer said it would take some time to tell me how to find the old type, and to come back some other night. Then he faded right into the old print shop. I looked around. Everyone was gone; the sky was getting light and I was sleepy. Editor's Note — To prove this is the truth, just look at your 1949 calendar. May the 13th is on Friday. WANTED: — by elderly man, experienced irrigator, permanent Desert Caretaker position, with modest dwelling on nearby tract with water, on installment or life-tenure plan. Excellent references. E.B. Hill, 387 La Cadena Dr., Riverside, Calif. 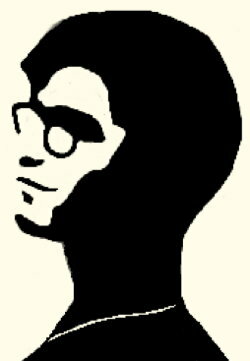 Readers Digest found Russ Nicoll. You Write to him, THERMAL, CALIF.
area 306 square miles, 25 0feet [sic] below sea level. Its surface is the fastest motor boat course in the world. and postmarks, firearms, pictures and documents. The rocking chair is an original American invention dating back to about 1765. Won't be long now till we'll have somebody besides the Weather Bureau to blame if we're short of mousture. We'll cuss out the rainmakers' union. A Fort Worth newspaper printed a personal ad that read, "If John Blank, who deserted his wife and baby twenty-one years ago, will return, said baby will knock hell out of him." Bats have been used to send messages across the border. Like homing pigeons, bats will return to the cave from whence taken. Smugglers liberate them after contraband is delivered. JUAREZ, Mexico — Prevention of cruelty to vegetables was the big news story here today. After much discussion the authorities proved that the Mexican Jumping Bean has a nervous system, and doesn't like being placed on hot plates — sunshine jumping was said to be O.K. Over 3,000 different herbs and plants for therapeutic use were grown in Montezuma's Mexican botanical gardens years before the discovery of America. It's a fact, that the Mexican national coat of arms was originated before Columbus discovered America.